Jesus has left instructions for us to go out into the world and make disciples of men and to love one another. Why is this such a difficult task for us to accomplish. The simple answer to this dilemma is basic logic in my opinion…we don’t know how to be a rock different than the rest. My other option to answer this question is that we all come from different walks of life and circumstances and are in need of repair which leaves us lying in a pile waiting to be used rather than getting out and moving about the earth doing as we have been commanded. What does it take to get us to move? I feel there has to be a willingness to want something different. There needs to be something within us that propels us to desire to change. As we begin to allow God to mold us and shape us into the image of His Son then others will see the difference and begin to want that in their life too. 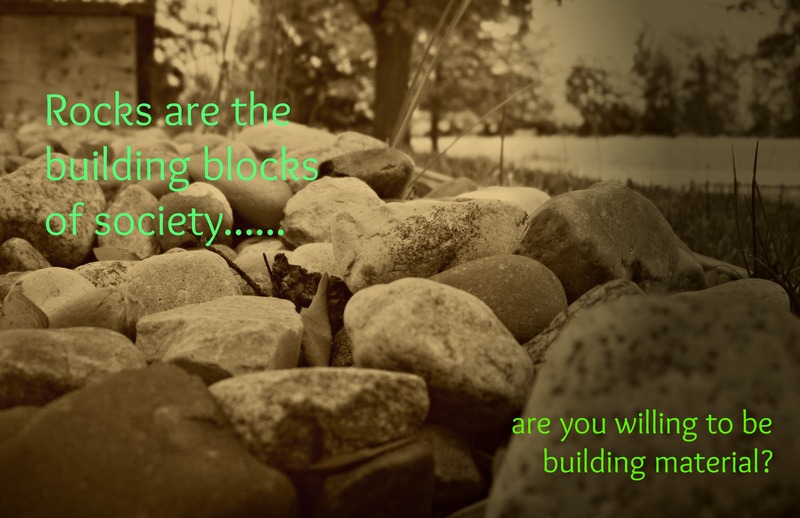 When this begins to happen we allow God to use us to build up other people and we become part of the building structure rather than just another rock in the pile. So the question we all need to answer as individuals is simple: Are we ready to surrender our single rock status and become transformed into a building block for His church? The moment we decide to surrender is the very millisecond God begins a mighty transformation in our lives.